As of last month, I have lived in our home for a whole year! My husband actually bought our home a year before we met and did a fantastic job renovating it. It has come a long way since he bought it and changed even MORE when I moved in. 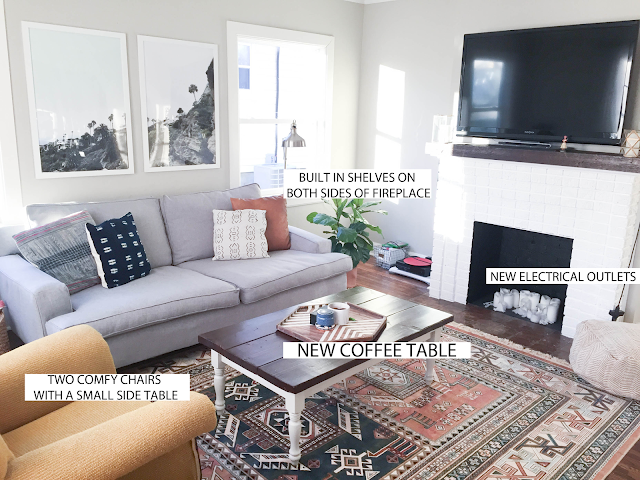 Our living room, dining room and kitchen are all open to each other and are what get most of the DIY and decorating attention so I am excited to share a little bit more of the process of what decorating has been like and how it is constantly changing. As you can see…this photo was taken through a window but it was the best "before" I could get. I never saw it in this state and I am really glad it did not stay this way! The carpet covered up our gorgeous wood floors and the brick was dull. 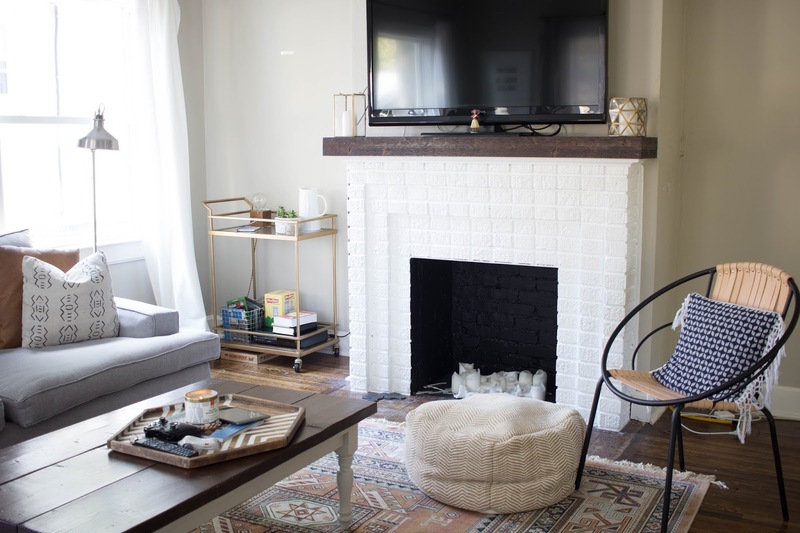 I really love the mantle and wall color my husband chose which make a huge difference in making our home as cozy as it is! This is from September of 2015! 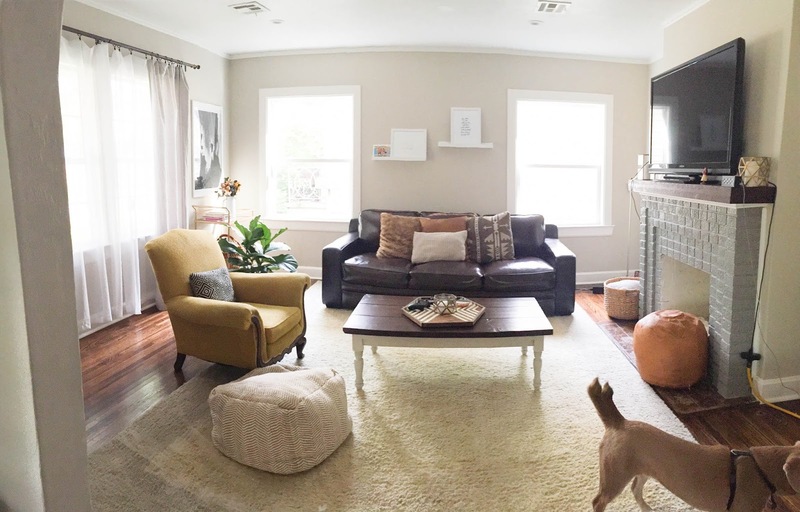 I wish I had a before photo of when the couch was where the yellow chair is and there was an over stuffed red recliner where the couch is…just imagine it. You can see in the left corner there was a giant picture from our honeymoon that got printed wrong that I never corrected - hence why it is sideways. I thought the picture ledges would be a good idea but I didn't like the scale or placement and just drilled way too many holes in that wall because of all the changes I've made. This is also right after we had recessed lights installed which was the BEST decision and I can't wait to have them in the rest of our home! This was soon after I reupholstered our couch! I liked this styling. It was clean and simple but still missing a few key changes I wanted/still want to make. The size of this rug was wonderful but the shedding and stains were not fun to deal with. You can see I switched the photo from the left wall to replace the picture ledges which made a huge difference! I also painted our fireplace and front door around this time. And here we are now! I really love how the living room is shaping up. 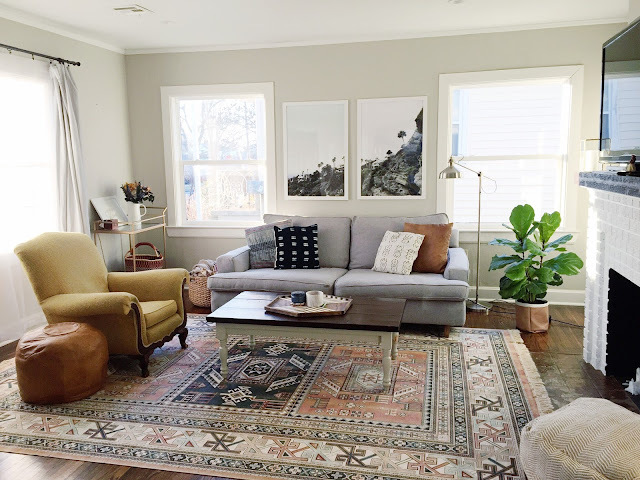 Of course, there are still some changes I want to make but getting a new rug really changed the whole room! I bought another large frame from Michaels (here is a blog post explaining how I printed and framed them for less than $20!)) and framed a photo from our recent California trip. I really like how the colored photos and vertical alignment helps the room seem even taller. 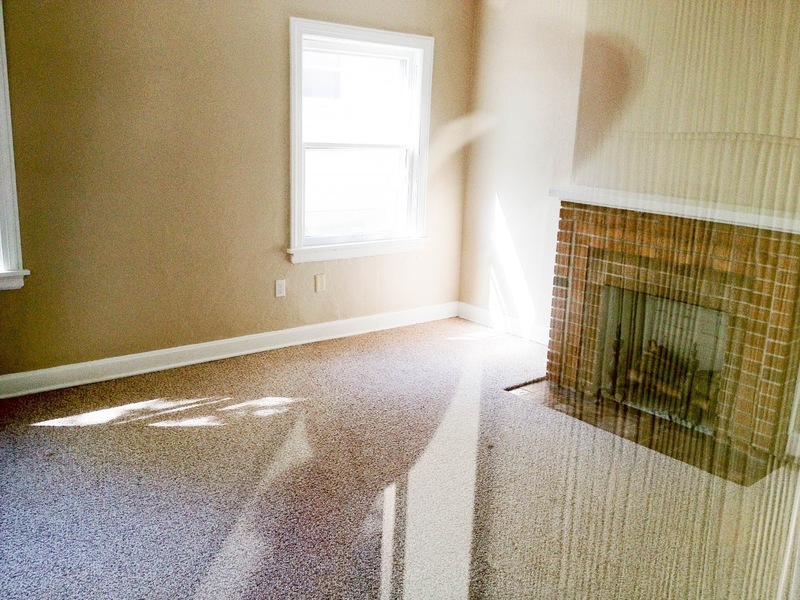 Our next big project for this room will be built in shelves on either side of the fireplace. The left side will have doors so we can stash cords and the xbox and everything that is necessary but not exactly pretty. We also will be adding new electrical outlets to hide those cords because our 1930's home is seriously lacking in the electrical outlet area. 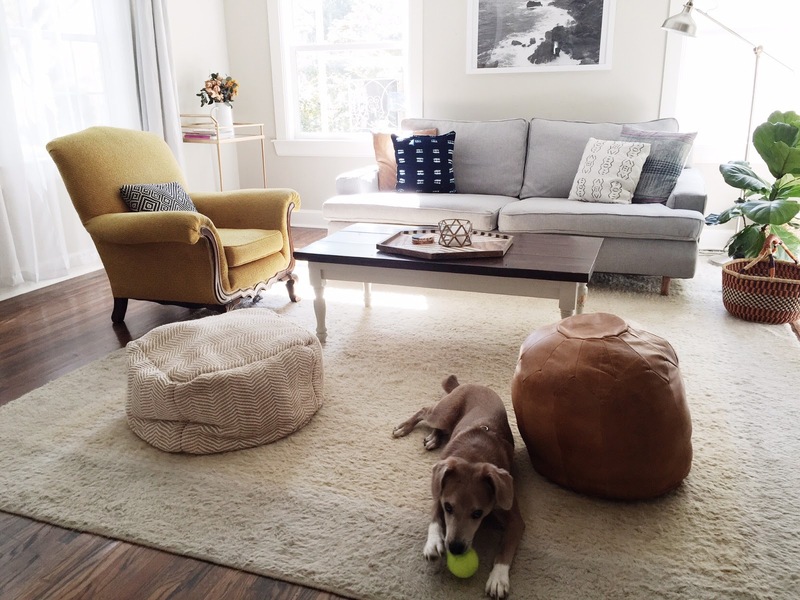 I have been eyeing this coffee table for a while to replace our chewed up table. 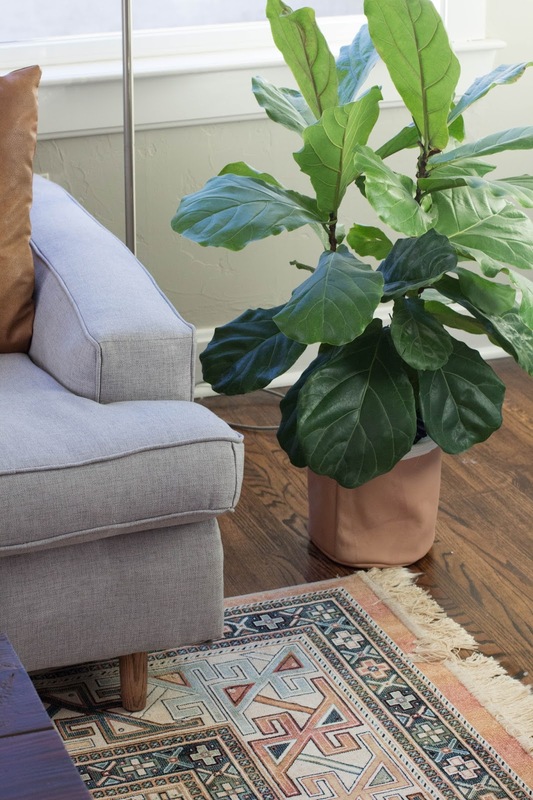 I really like how simple it is without adding weight to the room or covering the rug. I also want to relocate my beloved mustard colored chair somewhere else in the house and add two new chairs in it's place. I really love these but don't know how practical they are. I think I've reached my limit on patterned pillows (which I LOVE and are from Boho Pillow & Mae Woven) and need a few more that are solid colored and textured to add some depth without getting too crazy! My little fiddle is flourishing and looks so cozy in this leather basket/planter I made! Here is the tutorial. 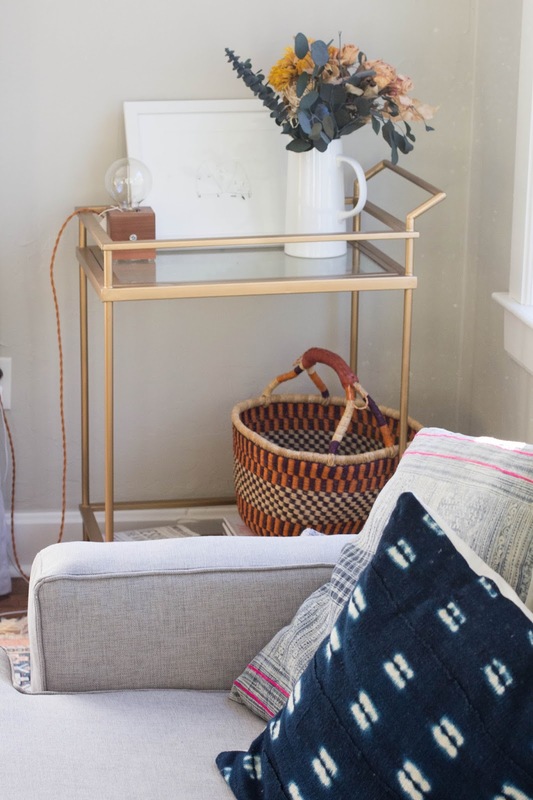 I still love our bar cart but I feel like I need to give it a new purpose! Right now it holds my favorite lamp from Yucca Lane and a framed inside joke between Jordan and me. We spend the most time in this room aside from me working in my home studio and it really makes a difference to be in a room you love and are comfortable in! It turned out really nice:) Great job! My favorite change? The rug! 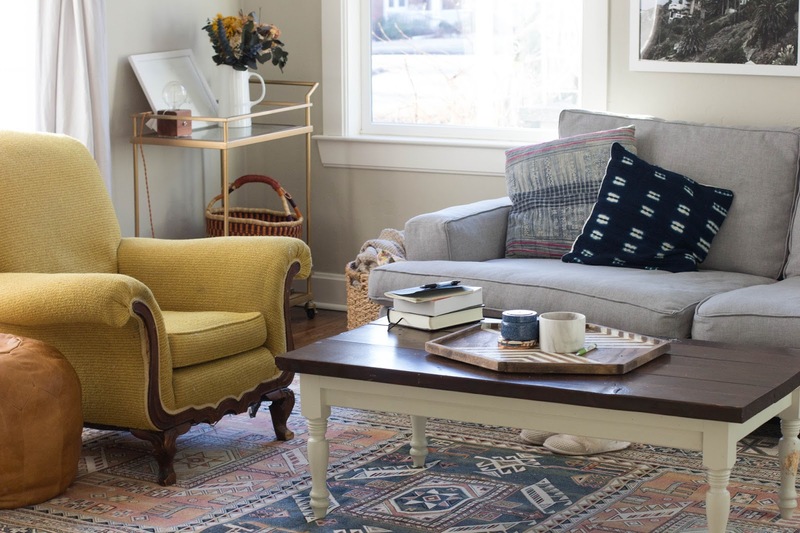 The colors of the rug and the pattern make it SO inviting! I love it. Yes!!! 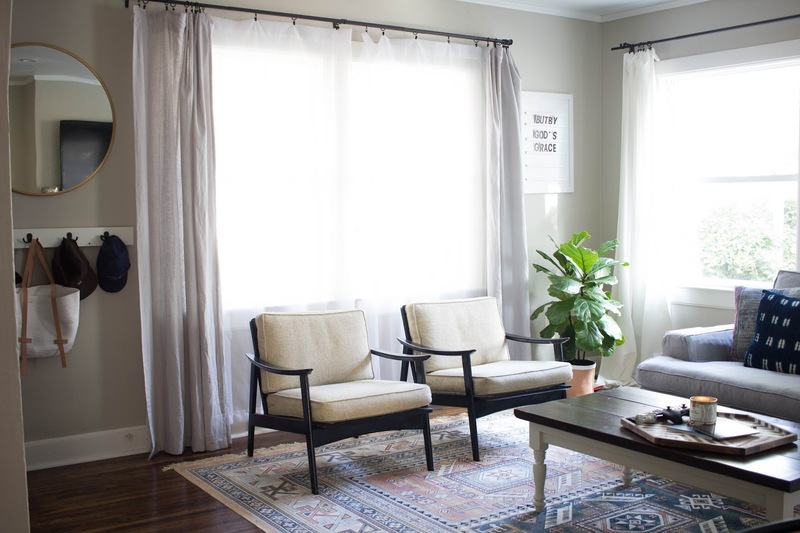 Love this rug? Do you know what it is called? It's from RugsUSA... Yes?! Love the rug! Where did you get it from? Here from your comment on YellowBrickHome. I LOVE the latest version. It's simple, yet sophisticated and modern, yet classic. What a beautiful space!